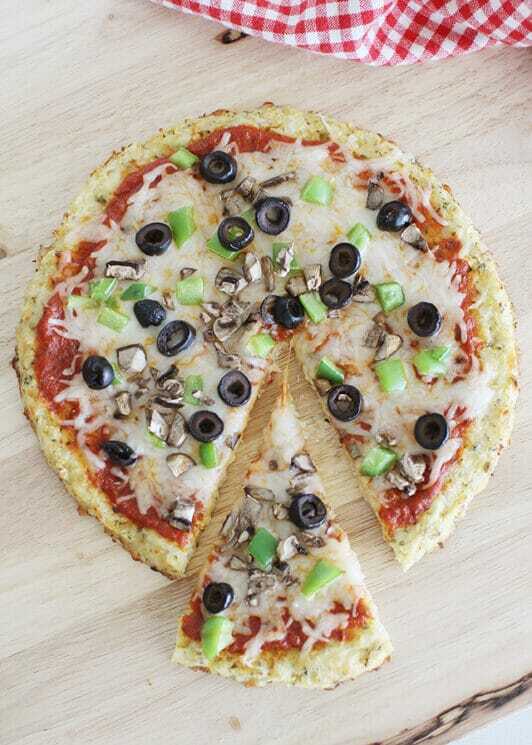 One of kids favorite comfort foods, this pizza is packed with veggies and made with a cauliflower pizza crust for a deliciously lightened up dinner! 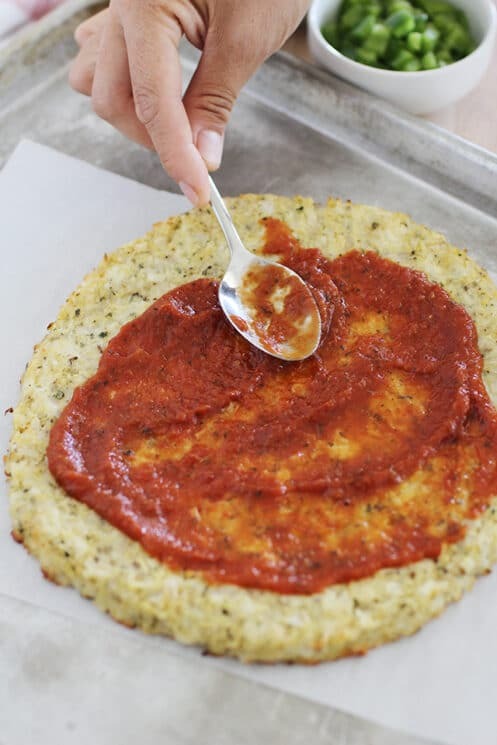 They key to making a really good cauliflower pizza crust is to squeeze the cooked cauliflower to get the most liquid out that you can. The cauliflower should be mostly dry when you are done. 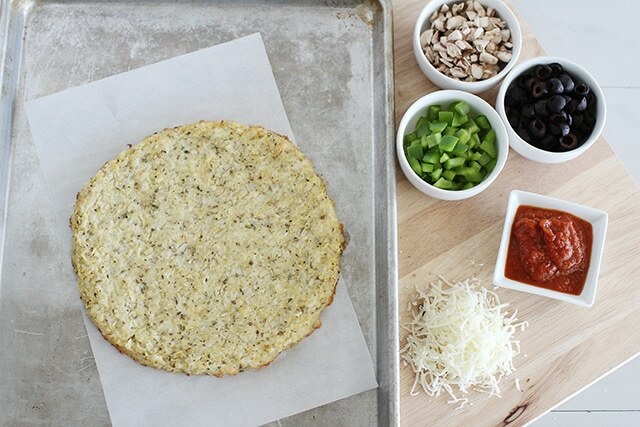 Here are the steps to making this delicious cauliflower crust. Chop cauliflower into florets. Add to a food processor and pulse until it becomes crumbly. Put into a microwave safe bowl and cook in microwave for 2-3 minutes until tender. Allow to cool on a clean dish towel. Once cooled, squeeze out any excess moisture by wringing the cauliflower inside the towel. Squeeze your little heart out! Transfer cauliflower into a clean mixing bowl. Grate the cheese; add 1/4 cup of the mozzarella, Parmesan, basil, parsley, oregano, salt, and pepper into the bowl. Toss to combine, and then add the egg. Stir until completely mixed together. Place “dough” onto a greased pizza pan (unless using a pizza stone). Shape into crust, making it thicker than you would for a regular pizza crust. Place into oven and bake for 15-20 minutes, or until golden. That’s it! 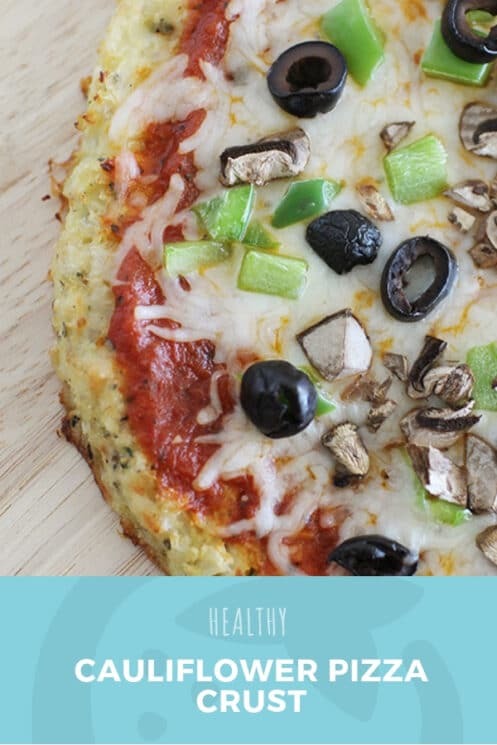 Cauliflower pizza crust is definitely one of those where a few steps are involved, but all in all it really doesn’t take that long. Yes, you sure can. You will bake it first and then once it is cooled, put it in a gallon ziplock bag. If it is too big, then you can wrap it in plastic wrap. Just try to make sure it is airtight however you store it. When you want to use it, then let it thaw, add your toppings and bake as directed after the toppings are on. 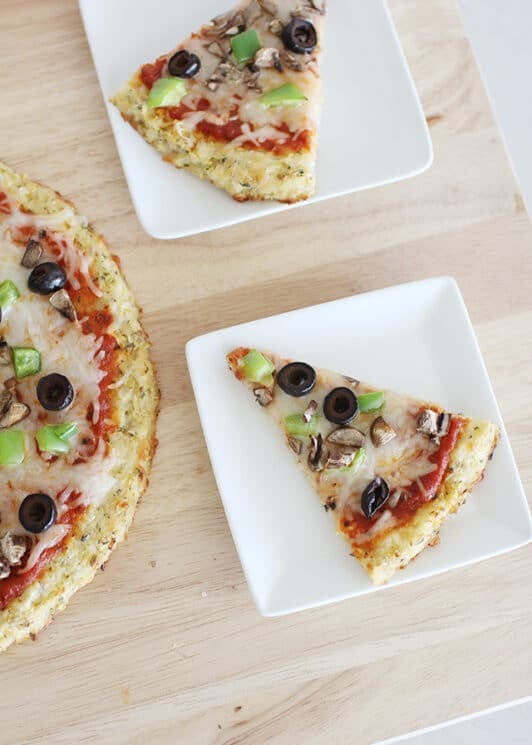 There are some great store-bought options for cauliflower pizza crust. However, sometimes there is just something about making your own from scratch that gives the flavor and texture a boost. Trader Joe’s has a cauliflower pizza crust that is vegan – no cheese or eggs. That may be a great option for those of you who have kids with food allergies or choose to eat a vegan diet. For those of you who don’t and just want to give your kids a little extra nutrition, or provide a lower carb/calorie option for your family then the homemade version of this might be best you. 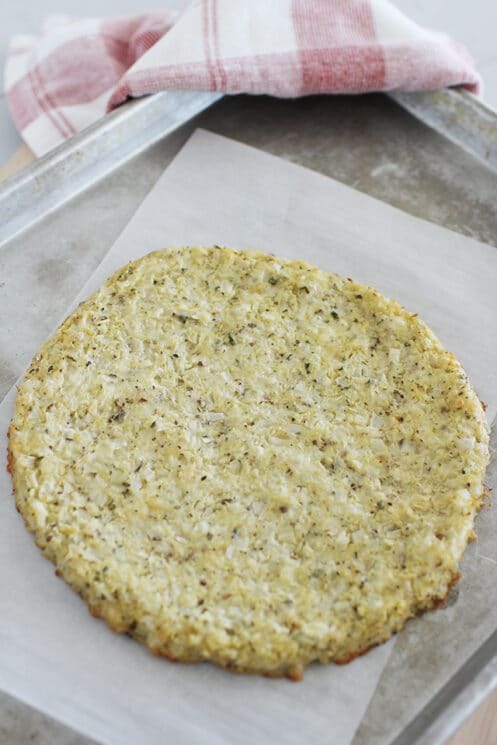 What is the Best Way to Grate Cauliflower for Pizza Crust? The fastest and easiest way to grate your cauliflower is in a food processor. It takes just a couple of minutes to grate and entire head of cauliflower. If you don’t have a food processor, you can definitely use a box or microplane grater. You can even use a blender if it has a pulse mode. You don’t want to ‘cream’ your cauliflower so be careful if you are using a blender. 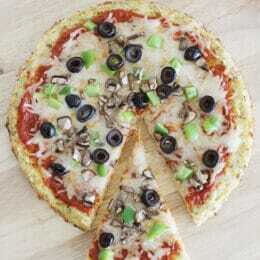 What are Good Toppings for Cauliflower Crust Pizza? More veggies of course! 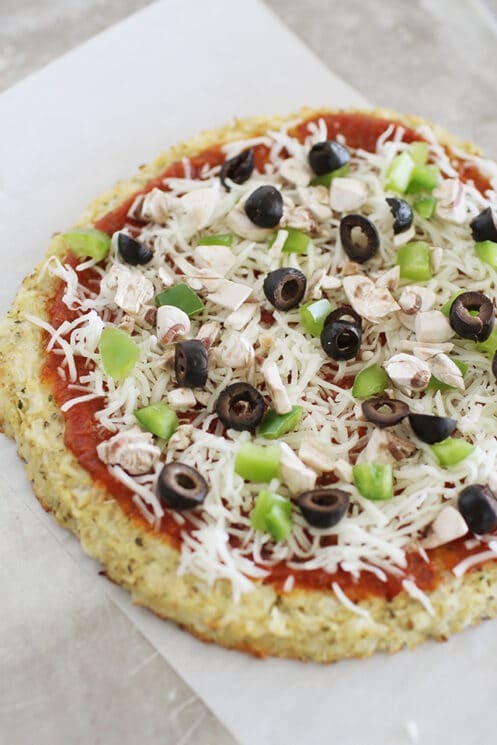 Actually a cauliflower crust is just like a regular pizza. Use whatever toppings are your favorite for your family. Preheat oven to 400 degrees F. Grease a pizza pan or use a pizza stone. Once cooled, squeeze out any excess moisture by wringing the cauliflower inside the towel. Transfer cauliflower into a clean mixing bowl. Place “dough” onto a greased pizza pan or pizza stone. Shape into crust, making it thicker than you would for a regular pizza crust. Set aside. Place into oven and bake for 15-20 minutes, or until golden. Slice olives, dice pepper and cut mushrooms into smaller pieces. Spread pizza sauce over crust and sprinkle with toppings and remaining cheese. Place pizza back into oven and bake for 10 minutes. Allow to slightly cool before serving. These look absolutely amazing!! I love baking pizza…so I’m excited to try these! Thanks for the recipe. I am wondering if I can use the frozen riced Cauliflower flower instead of processing my own? And if I can are there any changes I need to make the recipe? Yes you definitely can. I would let it thaw and then squeeze the water out of it. The key is to getting it as dry as you can. I’ve been on a cauliflower kick lately… definitely trying this! 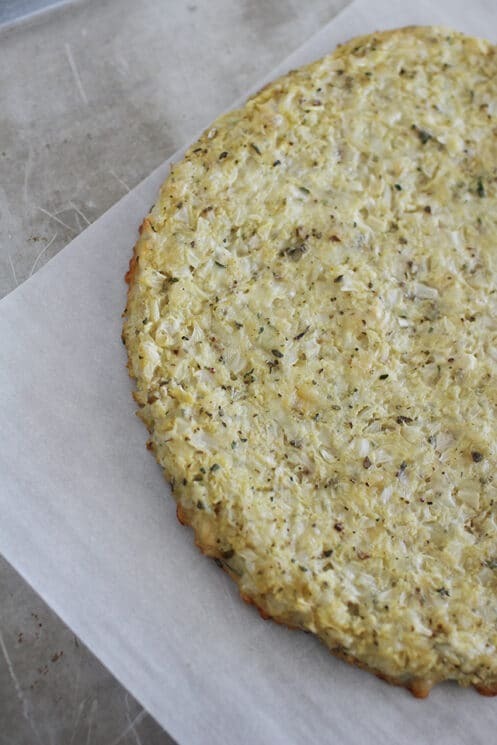 I tried a cauli crust several years ago and it was a disaster, I didn’t wring out the moisture so it was super goopy!